This map was an exercise to learn and develop content using Volition’s Chunk LayOut Editor, or CLOE. Overlook is a small town or outpost, about half of which is under EDF control. In Capture the Flag matches, the Red Faction flag is positioned on a high ledge, while the EDF flag sits securely in the EDF HQ on the opposite side of the map. The Red Faction base is wide open, but takes its strength from its height. If the catwalks leading up to the Faction base are destroyed, the attacking EDF must either repair them, or use the jetpacks and thrust packs in the area to gain access. The EDF base is heavily fortified, but a back route is available through use of the catwalk leading up and around the spire in the EDF base. 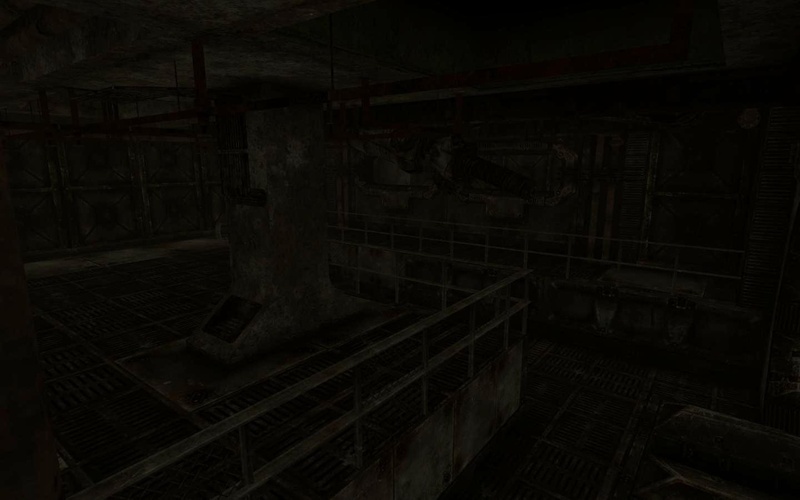 In Damage Control, the three control points are located at the bottom of the Red Faction’s cliffside base, just next to the guard tower in the EDF compound, and between the comm station and the water tower. This gives each team a point near their initial starting location, with the third point being roughly equidistant to each team’s start. All the weapons available in multiplayer are present in Overlook. Most of the more powerful weapons have the counterbalance of being placed in and on top of structures that are vulnerable to being destroyed (which in turn, destroys the weapon spawn.) 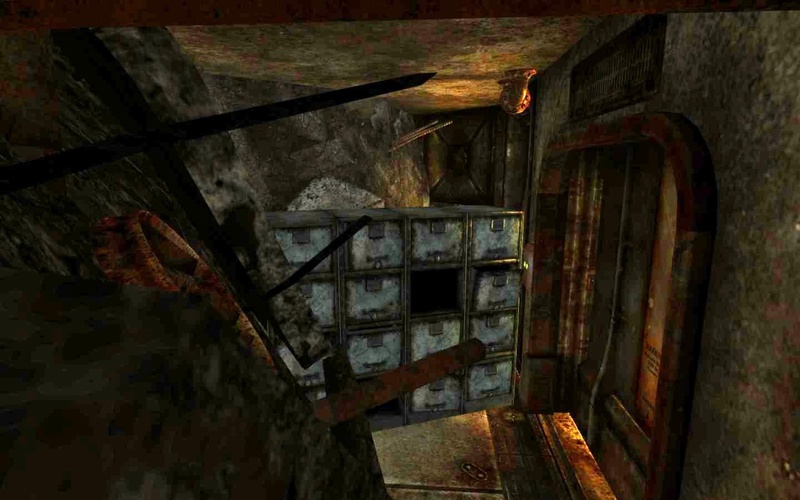 In addition, many weapons are hidden in crates, boxes and other enclosed areas. Overlook supports all multiplayer modes, with the exception of Siege. This is my first attempt at a large-scale map with the Unreal editor. My goal was to familiarize myself with the Unreal editor, and to create a large outdoor environment that has two very distinct sides. It seems like some of the most popular team-based maps are almost completely symmetrical. One of the best examples of this is the “Blood Gulch” map for Halo. 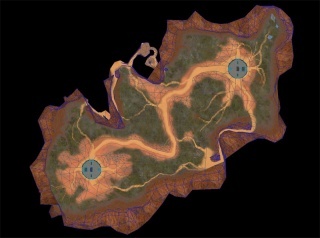 While it is not completely symmetrical, “Blood Gulch” does not have many unique landmarks to distinguish one side of it from the other. While some may claim this fosters a fair, pure skill-based competition, I think it takes a lot of dynamism from the level’s gameplay. My goal with “Disparate” was to create a well balanced Capture The Flag map in which the sides share few similarities. The red side is plain and mostly featureless, with the exception of a few Necris monoliths jutting from the landscape. The blue team’s side is more complex, with a narrow channel leading into their flag base. The balancing mechanic I attempted to use is the vehicles. While the blue side is allowed to use the small Scorpion buggies, the red side owns the Darkwalker, one of the toughest and deadliest vehicles in the game, along with a Scavenger, a fast crawling vehicle capable of navigating almost any terrain in the map. 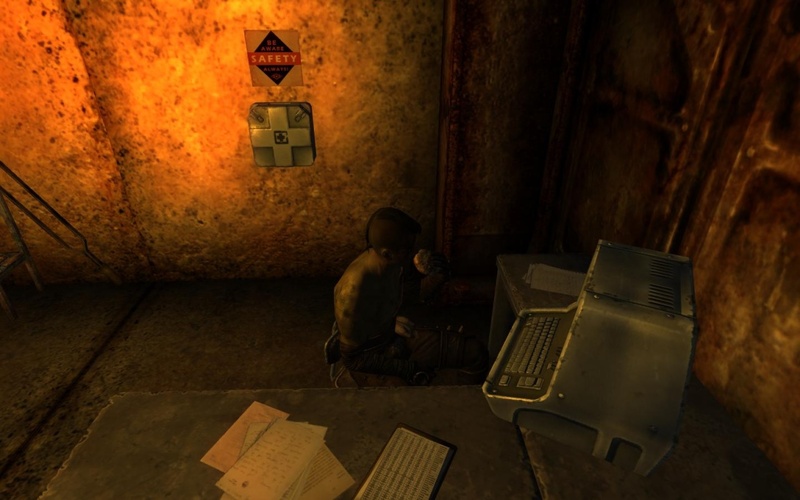 To familiarize myself with the Fallout 3 engine, I started the Vault 74 tutorial on the Bethesda website. I quickly grasped the basics of the editor, and decided to elaborate on the vault I was building. 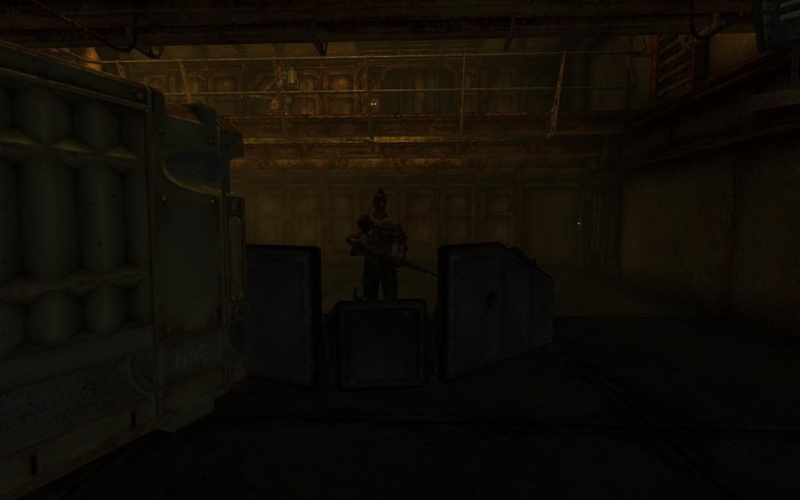 Even though raiders are portrayed throughout the Fallout 3 campaign as vicious and anarchistic, I would imagine that a group of bandits would need to be fairly organized in order to keep a vault in working condition. 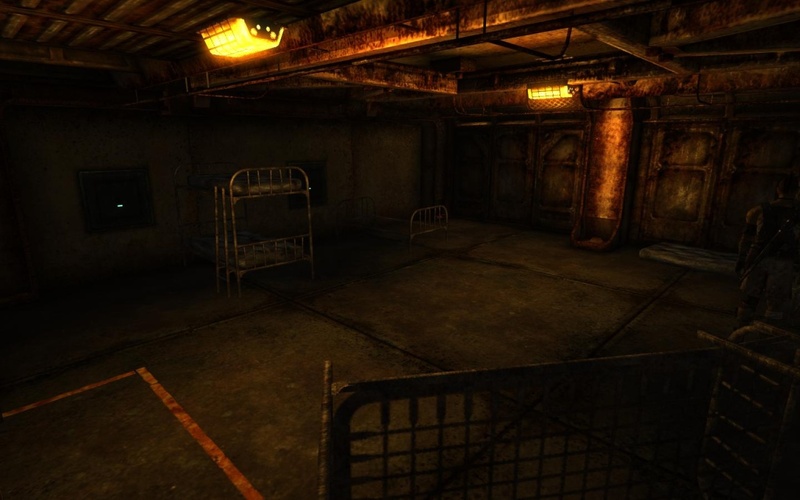 To reflect this image, the vault features characteristics that are in line with the vision of an abandoned or neglected facility (cave-ins, refuse, blood smears,) while still retaining basic functionality, like emergency lighting. 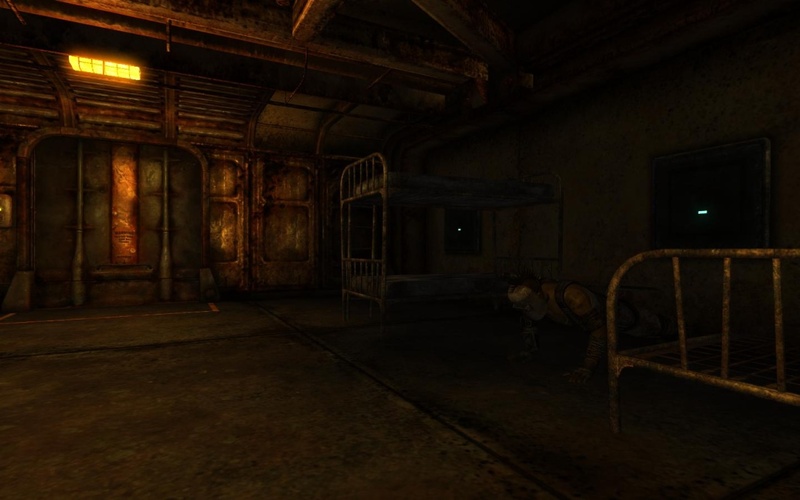 Within the vault, the raiders go about their daily activities such as eating, sleeping, exercising, patrolling, and using the few terminals that still exist in the vault. 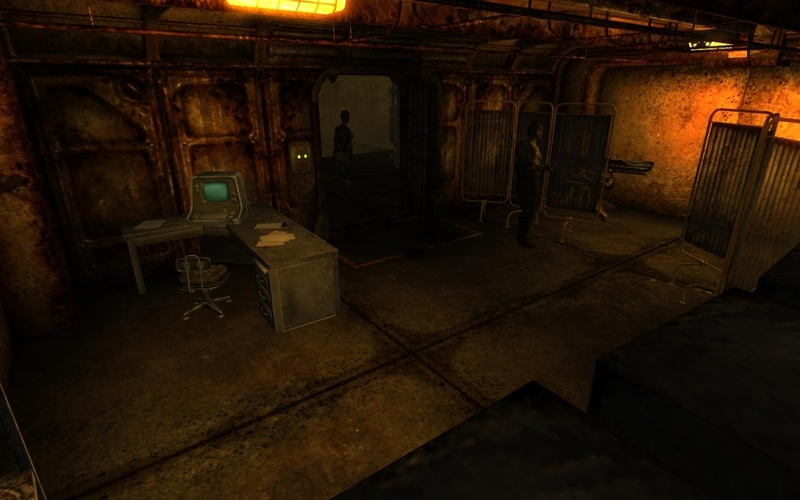 I included a diverse range of gameplay options within the vault, including traps, physically and electronically locked doors, turrets controlled by remote terminal, and a wide range of raiders in various states of combat readiness and armament. 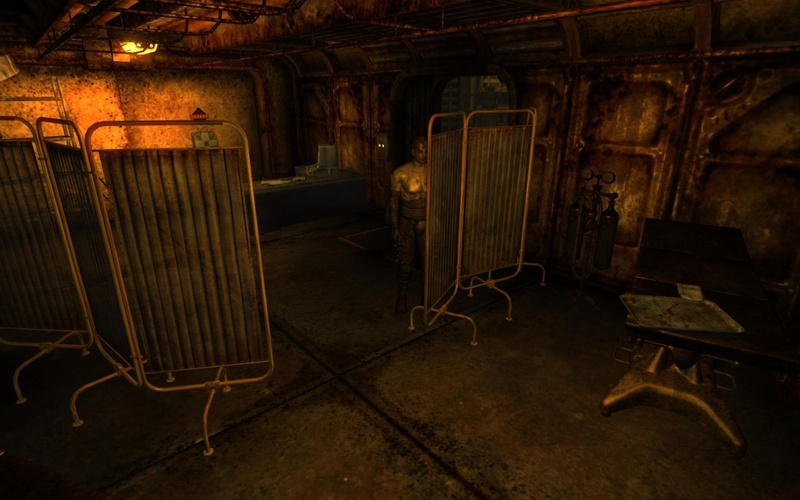 Living quarters for the raiders. Caved in room near a defensive turret. Clinic, located off of the main hall. Second shot of the clinic. A raider in the clinic takes a meal break. Just inside the vault’s entrance. A guard node where the entrance joins the main hall. A raider exercising in his quarters.